Alice Coote, one of the most distinctive mezzo-sopranos of today, makes her recital debut on Hyperion with pianist Graham Johnson, a stalwart of the label and tireless explorer of vocal repertoire. 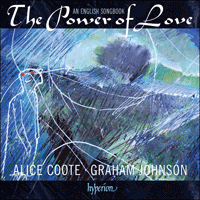 The Power of Love creates what Johnson describes as a ‘pageant of English song and poetry’. It’s a journey through half a century of song, surveying not just human love but love of nature and even of money. 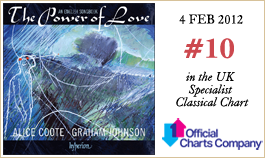 Some of the most touching pieces here involve the loss of love through death, not least Ivor Gurney’s Lights Out and Gustav Holst’s Betelgeuse. There’s serenity, too, in mellifluous settings by Roger Quilter, while high spirits are supplied by Maude Valérie White’s The Spring has come and Warlock’s sardonic Queen Anne, which includes the immortal lines ‘I am Queen Anne, of whom ’tis said / I’m chiefly fam’d for being dead’. Planning a convincing programme of miscellaneous songs for a CD is a greater challenge than most people realize. The aim is to produce a single arc of music and poetry, whereas in the LP era the programme had to be conceived with an interval. Those of us who have memories of putting together programmes in those days will confirm that it was an easier task. A clean break between the two sides of a vinyl record provided a welcome caesura and breathing space: there was often a change of subject and direction in the second half, very much like a recital in a concert hall. In the old days of shellac ‘78’ records a singer and pianist could make a rousing impression with merely two songs, back-to-back—a single morning’s work at the recording studio. Present-day artists have to record at least six or seven songs per day (there are usually three or four days of sessions) and some of their best work may be scarcely noticed in the welter of material required for seventy minutes, or more, of music. Because the number of songs is far greater than on an LP, a miscellaneous song CD can often be something of a ragbag, a random collection to be dipped into rather than experienced as an entity. It often happens that songs destined for a recital disc are shaped into a sequence long after the sessions and editing are over, the running-order determined by the producer or the recording company rather than the artists themselves. This last-minute song-shuffle can all too easily result in unsatisfactory compromises regarding the contrast and juxtaposition of speeds, moods and tonalities (and this applies equally to single-composer CDs). At this stage the priorities are often mainly vocal: the more successful performances are strategically placed to give the best impression while the less successful ones are slipped in where their weaknesses will be less noticed. When Alice Coote and I met to plan an English song disc it was soon clear she wanted to create and gauge the shape of the programme long before we engaged in the recording process. She needed to ‘weigh’ the poems, one against the other, as if we were creating a recital for a live performance at, say, London’s Wigmore Hall—apart from the fact that there was to be no interval! Untiring curiosity is one of the signs of a great singer, and another is an instinctive awareness of what is vocally possible, and what might be, indeed must be possible with determination and hard work. Our rehearsals, once the repertoire decisions had been taken, were calm and considered, but the decision-making process (what to sing and what not to) was exciting—a process that was entirely visceral and accompanied in each case by Alice’s instantaneous emotional response to the music. I shall not easily forget the last and most powerful of these moments. It had been our intention to end the disc with Ivor Gurney’s Lights Out, an other-worldly valediction associated with one of the great composers of the First World War and his comrades, and an equally great poet, Edward Thomas, killed in action at Arras. The discovery of this neglected song had been moving in itself, but on the final day of planning, before the rehearsals started in earnest, it dawned on us that two of Gustav Holst’s songs to poems of Humbert Wolfe, composed ten years later, would form a fitting epilogue to our programme in a way hitherto unimagined. At the end of Lights Out, as the music flickers and fades away, we are left standing on the borders of No Man’s Land, as if in Flanders during the Great War. In daring to cross that boundary, these two Holst songs immeasurably extend the emotional scope of the disc. At the beginning of Journey’s End the singer and the listener must take that short and irrevocable step that separates the third of the Gurney songs from the dark antechamber of death itself, an even bleaker No Man’s Land (‘What will they give me, when journey’s done? / Your own room to be quiet in, Son!’). But there is something even beyond this in terms of time and space. The final destination of the journey is Betelgeuse—a cosmic No Man’s Land, a star light years beyond death (‘And birth they do not use / nor death on Betelgeuse’), an exit point arranged for us by the composer of The Planets that is as impervious to the power of love as to the power of hate. At the opposite end of a broad programmatic arch, this bleak and distant star is a hollow echo of the moon that has been so lovingly evoked by Byron in the programme’s second song (and which has reappeared here and there in the programme, notably in two Gurney songs). In this light it is indeed true that we—and the rest of the world in the rest of time—will ‘go no more a-roving’. In coming full circle and reaffirming the ancient dictum that in our end is our beginning, Alice and I had finally found a way to round off our many hours of programme-planning. She already had an image in mind for the cover, a painting by her father Mark Coote. Our musical work could at last begin.